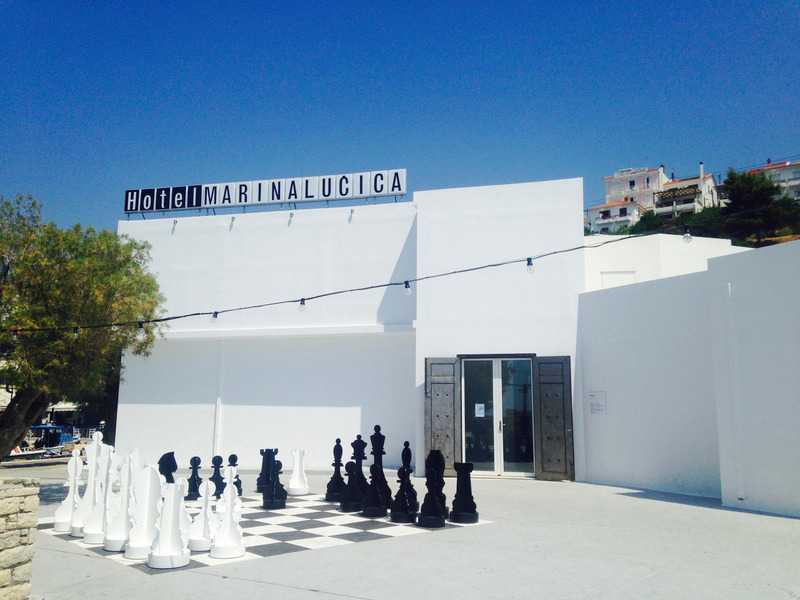 Katarzyna Sobucka was one of the curatorial fellows commissioned to work on a programme accompanying 'Hotel Marina Lučica' by Aleksandra Domanovic. 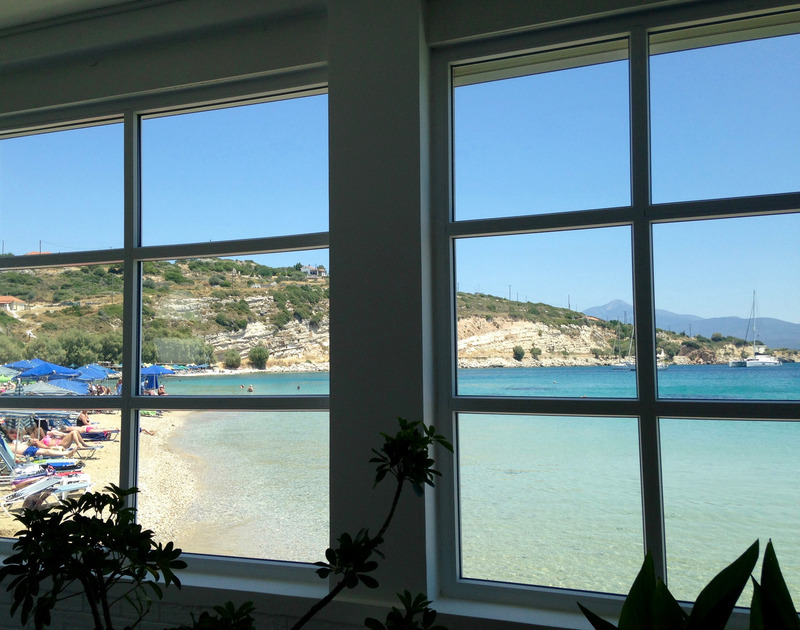 The Art Space Pythagorion opened in 2012 with a ground-breaking exhibition by the artist Harun Farocki. A former hotel built in the 1970s, the host building was extensively renovated by the local architects Peni Petrakou and Stelios Loulourgas and purposively converted into a modern exhibition space. With its fitting location on the harbour of Pythagorion, the building is in situ against a backdrop of East meeting West. This "white cube" is a symbolically rich juncture between the Orient and the Occident. In Art Space Pythagorion, the exhibitions curated by international contemporary artists were presented during the summer months, in parallel with the Samos Young Artists Festival. 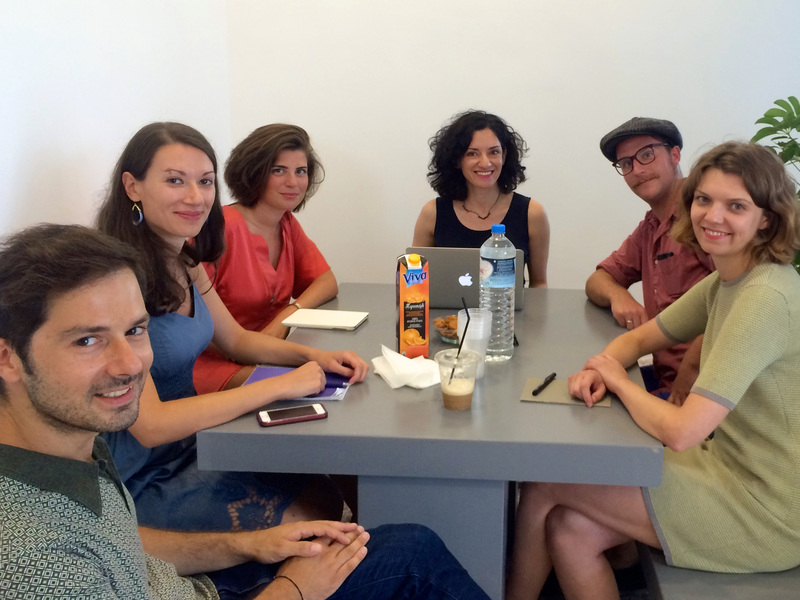 The Art Space Pythagorion was an initiative launched by the Schwarz Foundation based in Munich. 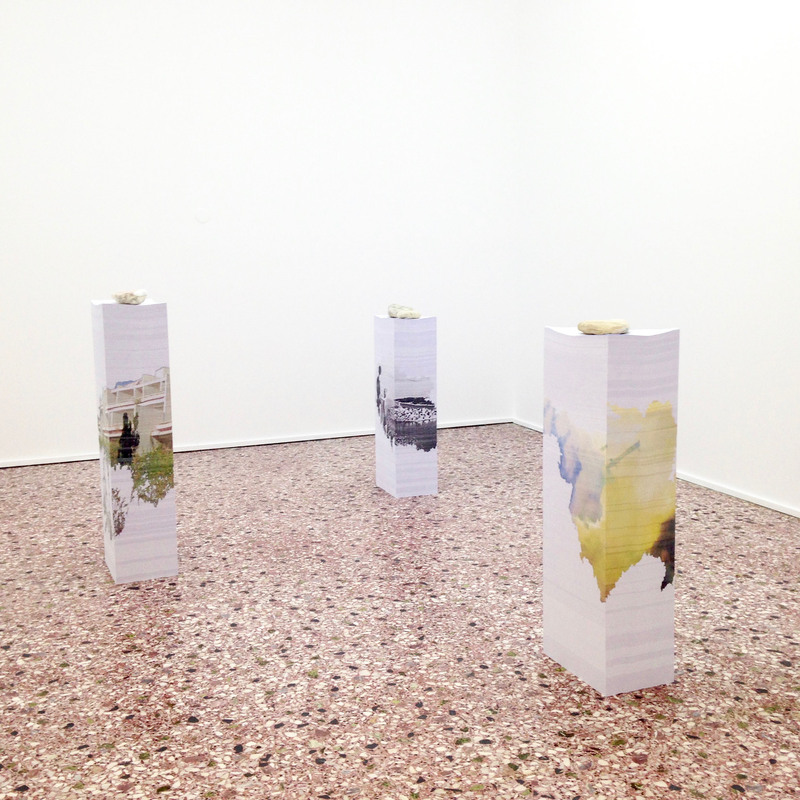 Personal and socio-political histories often blur and intersect in the works of Aleksandra Domanović (b. 1981, Novi Sad). In seeking to counter a conception of historiography which mimics a progressive and cumulative “timeline”, the artist engaged in historical enquiry which highlights the chaos, inconsistency and cyclic patterns in human histories. The artist uses sculpture, video, photography and installation to emphasise the hidden, the excluded and the illogical in our conceptions of past. Hotel Marina Lučica collates a series of artworks produced over a five year period, including a number of at the time new commissions, which examine the lead-up to and repercussions of the dissolution of former Yugoslavia – the place where Domanović was born and where she grew up. The exhibition takes its title from a former resort located on the Croatian coast. The Hotel Marina Lučica is remembered and reconceived by Domanović, who spent a summer there with her family just before the outbreak of the civil war. By 1992, less than two years later, the resort had been redesigned as a recruitment centre for Croatian soldiers, and it was later used as a refugee home throughout the Yugoslav Wars. Since the late 1990s the hotel has sat vacant, gathering graffiti, waste and miscellaneous deposits of used goods. Just inside gallery's entrance is a digitally produced portrait of Josip Broz Tito – the former autocrat of Yugoslavia. Portraits of Tito were hung in most public buildings – governmental offices, schools and hotels – during his reign in government. In Portrait (Bump Map), 2011, the formerly masculine personification of a nation-building process, the watchful guardian of the national citizenry, has been “feminised”. Tito's features have been softened and visually combined with the artist's memory of her childhood school teacher. In the work, the Hotel Marina Lučica and Art Space Pythagorian – also a former beachside resort – are mapped over each other, creating an environment that blurs the sites of art with sites of hospitality. Hotels and museums share a common promise of affording their visitors new, sometimes profound, experiences. Acting as cultural ambassadors of the nation and its character, the two sites are invested with new purpose and political sentiment via the exhibition of a range of works by international artists. Domanović's exhibition thus reframes the ostensive and official image of Yugoslavia as purported by its elite leadership, and conveys it as being characterised by economic inequality and socio-political strife. The Hotel is used as a metaphor for the tentative, selective, exclusory history-formulation which typified former Yugoslavia’s sense of collective identity. Hotel Marina Lučica delved into the tri-polar relationship between national histories, personal identities and cultural expressions. Along with Domanović's reimagined portrait of Tito, three videos were made on the diverse dimensions of Yugoslav history; there were also sculptures which reconstructed the illuminated sign that sat at the of the portico of the hotel before it fell into disuse were used to challenge and fragment popular conceptions of Yugoslavian history, nation and culture; an audial installation resonated through the former lobby of the building, experimenting with Yugoslavian collective stories via its sounds; and a giant chess board was positioned in the exact loci where once there had been a vast and imposing Soviet statue, evoking reflections on the playfulness and arbitrariness of nation-building and national-cultural imaginings. A panel discussion took place at Art Space Pythagorion in August, with Carolyn Christov-Bakargiev (Director of the Castello di Rivoli Museum of Contemporary Art), Andrea Lissoni (Senior Curator, Tate Modern), Susanne Pfeffer (Director of Fridericianum, Kassel), Paul Pieroni (Senior Curator at the Gallery of Modern Art, Glasgow) and Andreas Angelidakis (artist, curator, architect & teacher) discussing the restructuring of Europe and the meaning and function of art in the emerging landscape.